Italians, pizza, and the mob. It may sound like a clichéd movie plot, but those are the details surrounding an FBI mafia bust. The mobsters were operating a drug trafficking ring on both sides of the Atlantic, using a New York pizzeria as their HQ. The suspects – members of the notorious ‘Ndrangheta mafia group, based in Calabria, Italy – were operating a drug smuggling operation between New York, Italy, and Central America, AP reported on Thursday. 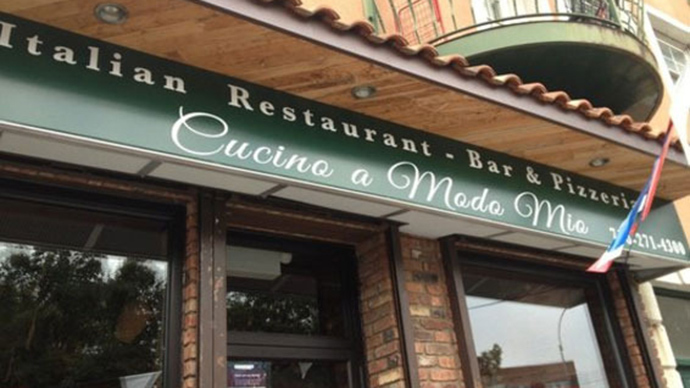 It was run from Cucino a Modo Mio (I cook my way), a restaurant based in the New York borough of Queens. The site also served as a weapons cache for drug traffickers, according to investigators. “In the evening, the family ran a good pizzeria. In other hours they were running” the drug trade, said Andrea Grassi, chief of the Italian state police special operations unit SCO. Authorities said they began the probe last year, and have since seized 60 kilograms of cocaine in the Netherlands and Spain. Citing police, AP said the operatives bought the cocaine in Costa Rica, using cash brought in specially constructed suitcases. It was stored in Delaware and Pennsylvania until it could be shipped to Northern Europe and Italy, using a produce company as a cover. According to Ansa news agency, the drugs were smuggled out of Central America using containers filled with bananas and exotic fruit. The anti-mafia sweep, dubbed ‘Operation Columbus,’ was orchestrated by the FBI and Italian police. At least 13 people were arrested in Calabria on Thursday, and 30 others are under investigation. Three other Calabrians were arrested in New York several weeks ago. Properties were searched and assets seized in the bust; over US$100,000, six pistols, a rifle, cocaine, and marijuana were found in the restaurant. While ‘Ndrangheta has known operatives in Canada and Australia, this probe convinced investigators that the clan has increasingly moved its workers and bosses to the US, according to Renato Cortese, a top Italian police official. Additionally, the probe allowed investigators to determine old and new alliances between ‘Ndrangheta and the Sicilian-American mafia families Gambino, Lucchese, Bonanno, Genovese, and Colombo, La Reppublica reported. Previous investigations had established the supremacy of ‘Ndrangheta in the international drugs trade. It comes just one month after New York mafia boss Francesco Palmeri was extradited to Italy for allegedly demanding one million euros (US$1.12 million) from an Italian businessman as repayment for a loan allegedly owed to New York’s Gambino mafia clan.